A composite of several Cassini images shows Titan's varied surface, including possibly a remnant of an old impact basin (large circular feature near the center of Titan's disk). Mountain ranges to the southeast of the circular feature, and the dark linear feature to the northwest of the circular impact scar may be evidence of past tectonic activity. When theCassini spacecraft reached Saturn?s largest moon Titan and deployed its Huygensprobe to study the surface, it lifted a shroud that had hung over a world possiblycontaining conditions for life?s building blocks. Now aplanetary scientist and an astronomy writer have laid out Cassini?s findings andTitan?s enduring mysteries in a new book, ?Titan Unveiled? (PrincetonUniversity Press, 2008). As Cassini enteredSaturn's orbit in 2004 and began snapping images during flybys of Titan laterthat year, scientists realized that Titan has sand dunesnot unlike those in the Sahara desert. They had assumed little sand would existat the moon because of a lack of erosion processes, and that Titan?s windslacked the strength to create dune patterns. "Bothhypotheses were wrong for interesting reasons," said Ralph Lorenz, co-authorand planetary scientist on the Cassini-Huygens mission at Johns HopkinsUniversity Applied Physics Lab in Maryland. The sandhad originated not from erosion pounding rocks into small grains, but insteadfrom chemicals that drizzled down from Titan?s clouds. Cassini also foundpowerful near-surface winds at Titan due to the gravitational influence ofSaturn on the atmosphere. Anothersurprise arose from ?just how glaring the influence of rainfall and rivers wasin the Huygenslanding,? Lorenz told SPACE.com. Titan?s surface and atmospherecontain methane, which acts like liquid water under the frigid temperatures ofroughly -290 degrees F (-179 degrees C) on the surface. Falling andflowing methane may only form a temporary feature on Titan?s surface, butCassini also detected largerbodies of liquid such as lakes, using optical cameras and radar. However, thesouth polar region of Titan appears to have fewer lakes ? just one of thedifferences between the north and south poles that has become an ?emergingmystery,? Lorenz said. An addedbombshell came from the discovery that Titan?s icy surface slides around like cheese onpizza sauce. That suggests the moon harbors a hidden ocean that may consistof water and ammonia. Yet one ofTitan?s most noticeable features remains a mystery. An orange shroud of methanehas long hidden the moon?s surface from astronomers' eyes, but remains despitegetting steadily destroyed by the sun?s harsh ultraviolet rays and making upjust 5 percent of the mainly nitrogen atmosphere. Scientists suspect the methanemay get replenished by underground lakes or volcanic vents. 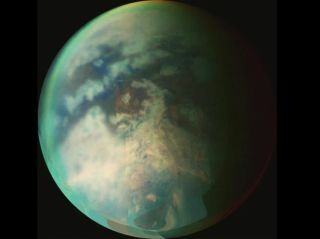 Strangenessaside, Titan still astounds scientists who "didn?t expect it to be soEarth-like and varied," Lorenz noted. The dunes, lakes, rivers and rain allappear strikingly familiar and suggest a constantly changing climate that goeswith Titan?s seasons. Cassiniwill continue to map Titan and explore its surface as the probe swings byduring the course of its extended Saturn mission. But Lorenz and otherscientists eagerly await a dedicated Titan mission that can thoroughly examinethe moon ? although it may have to competewith Europa as an attractive destination.